SEOUL, Oct. 11 (Yonhap) -- The chairman of South Korea's fifth-largest conglomerate Lotte said Thursday that he is sorry for difficulties caused by his recent detention in his first public statement to his employees. Shin Dong-bin also expressed gratitude to the employees for their dedication to the group as he vowed to make efforts to normalize the conglomerate. Shin's message was the first since he was released from jail last week. 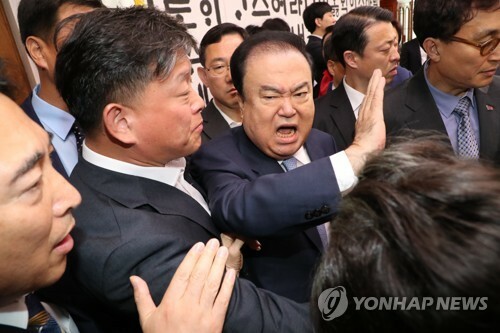 He had been in a detention center since February for involvement in a corruption scandal that led to the ouster of former President Park Geun-hye last year. On Friday, the Seoul High Court sentenced Shin to two and a half years in prison. The appeals court suspended the sentence for four years, meaning that Shin will not have to serve prison time if he stays out of trouble during that period. Lotte Corp., the holding company of Lotte Group, said Wednesday it has acquired a 23 percent stake in Lotte Chemical Corp. from two affiliates of the retail-to-chemical conglomerate to enhance shareholders' value. Last year, Lotte launched the holding firm in a bid to help Shin solidify his leadership and streamline the group's managerial system.